Organ donation saves lives and so can you. 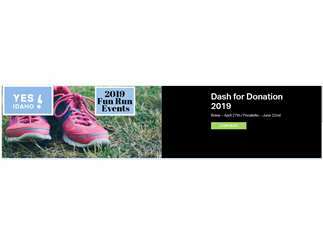 Please join us for the 1st annual Dash for Donation. Register as part of a team and get a discount on registration. Register before February 1 for early bird pricing. There will be a $5 discount in registration prices for anyone registering on or before February 28, 2019. After February 28, the following prices will apply. T-shirt sizes will not be guaranteed for anyone registering after April 15. Cost: Register before February 1 for early bird pricing. There will be a $5 discount in registration prices for anyone registering on or before February 28, 2019. After February 28, the following prices will apply. $30 individual racer $25 per person - team registration (5 or more racers) $15 students Children 5 years of age and younger are free.